…Still Life painting must be of a well understood simplicity, solid, strong, vital, unnecessary details neglected, salient points embellished, made the most of, every touch full of meaning and for the love of beauty. 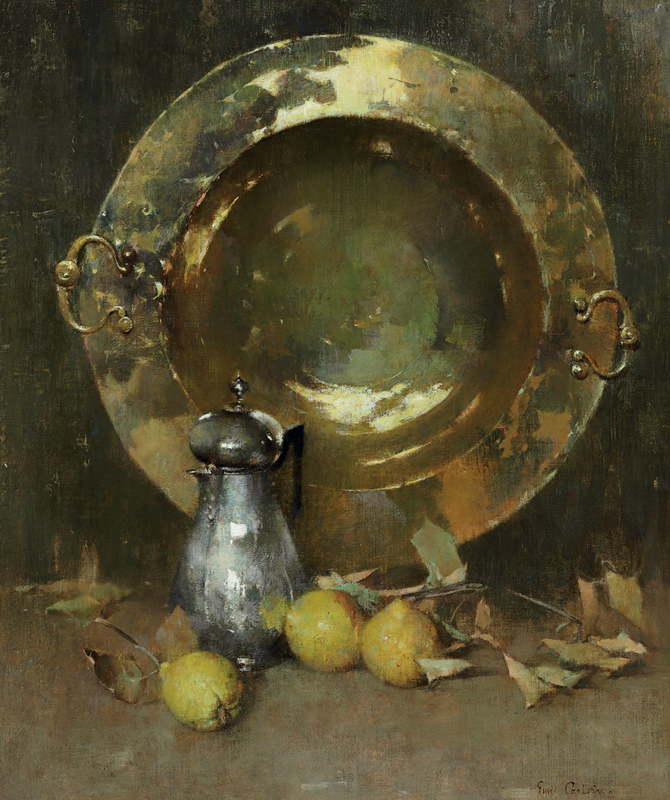 L ATE IN EMIL CARLSEN’S career, when the painter was nearing seventy, he was asked to appraise the artistic achievements of his close friend the painter J. Alden Weir, who had died not long before. In response, Carlsen not only paid tribute to an artist he deeply admired but also revealed an important key to his own artistic philosophy, and, in particular, to his beloved realm of still life painting. The modest details that we possess about Carlsen’s career fit the description of the artist’s life as “uneventful” made by the admiring collector Duncan Phillips. In 1931 the writer Eugene Neuhaus added that “Carlsen never was much of a social being in the active sense, and in New York, today he never has been a conspicuous figure in the social life of artists.” (4) In fact, Carlsen did his part in joining a number of artists’ societies and serving on exhibition juries from time to time (5), but his overriding preoccupations remained his work and his family which he cherished privately. Vermeer [1632-1675] (fig. 4), Diego Velazquez [1599-1660], and Rembrandt van Rijn [1606-1669] among others. Carlsen’s seemingly wide travels in America and Europe are only poorly documented, but when given the slightest prompting he spoke with intimate familiarity of collections and artists in France, Germany, Italy, and England. Purportedly born in Copenhagen in 1853, Soren Emil Carlsen first studied architecture at the Royal Danish Academy before emigrating to America in 1872. (14) Carlsen has already entertained hopes of becoming a painter when he arrived in the United States, having executed some marine sketches in Denmark before emigrating (15). Although New York was Carlsen’s first destination, he left almost immediately for Chicago where he was employed as an architect’s assistant at a salary of $20 a week. He then went into partnership with another painter, operating a school for mechanical drawing; however, this venture ended abruptly when the partner absconded with the cash along with one of Carlsen’s large paintings. In 1875 Carlsen returned to Europe to continue his studies, having been urged to do so by painter L. C. Earle [1845-1921], who had himself just returned from abroad. Carlsen went first to Denmark and then to Paris, where he stayed for six months until his money ran out. Instead of returning to Chicago, Carlsen took up brief residence in New York, where he lived in a boarding house on 23rd street and rented a studio near one occupied by the painter John Francis Murphy [1853-1921] whom Carlsen had befriended in Chicago. In trying to eke out a living he produced and sold, among other work, a few “comic drawings.” He had to rely on money from home for his support (16), however, and it was not long before he decided to seek his fortune elsewhere. Carlsen moved to Boston in 1876 and lived there for the next eight years. After an initial period of prosperity, his financial situation deteriorated once more and in 1879 he was forced to sell his paintings at public auction, an affair which realized so little that he ended up in debt to the auctioneer. The result was that he gave up his studio and took employment as a commercial designer and engraver. It was at this time he first met the painter Childe Hassam [1859-1935], who was to remain a life-long friend and mentor. Hassam, younger by six years, was then an aspiring illustrator and painter who remembered having worked with Carlsen making architectural designs for the steel engraver John A. Lowell (17). This sort of commercial work paid Carlsen handsomely and, as was his habit during these years, he used such opportunities to recover financially before setting himself up once again in a studio to pursue his painting. Twilight). In 1883 he also sent a still life to the annual exhibition of the Pennsylvania Academy of the Fine Arts in Philadelphia titled Peonies (19). Although floral paintings were represented in the early 1880s, the bulk of Carlsen’s still lifes seems to have centered on game, fish and household utensils, a category of so-called “kitchen still lifes” produced after the model of the French eighteenth-century painter Jean Simeon Chardin. While it is often presumed that Carlsen’s interest in Chardin first developed during his six-month stay in Paris in the mid-1870s, what little we know if his then predominantly landscape work suggests no such influence (20). Coincidental perhaps, but parallel to Carlsen’s awakening to the French master was the fact that in 1880 an important example of Chardin’s work, Kitchen Table of 175 (fig. 3), was presented to the newly founded Boston Museum of Fine Arts and exhibited there. A second painting by Chardin, Still Life with Tea Pot, Grapes, Chestnuts, and a Pear, was given to the museum in 1883. In choosing Chardin as his model, Carlsen allied himself with a larger group of mainly European artists who from the mid-nineteenth century had found in the French master’s unaffected examination of everyday objects a prototype for modern realist painting (21). 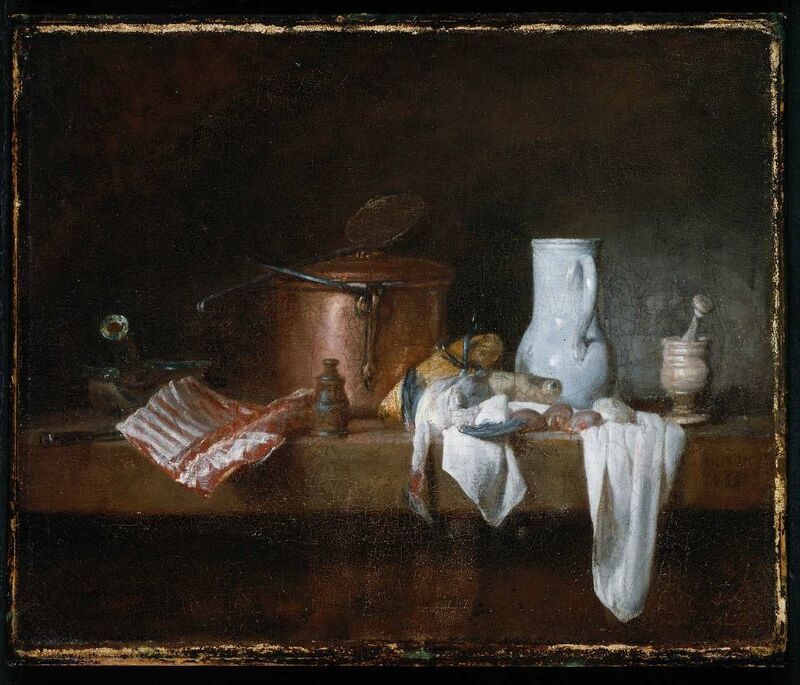 Yet it was Chardin’s painting techniques as much as his subject matter he admired and his own modern sensibilities. 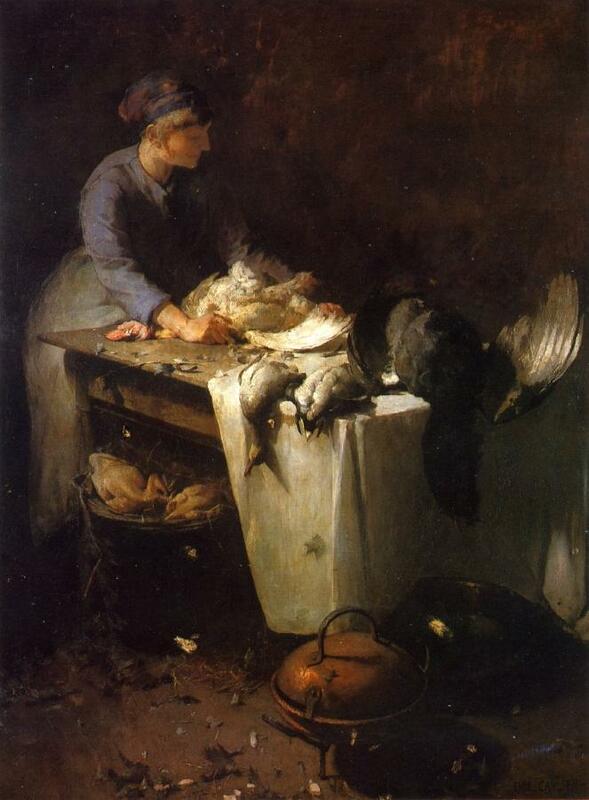 Among other European admirers of Chardin were Antoine Vollon [1833-1900], Francois Bonvin [1817-1887], Theodule Ribot [1823-1891], and Joseph Bail [1862-1921]. Carlsen’s study of the seventeenth century was doubtless reinforced by the intense interest in Dutch and Spanish masters—Franz Hals [1580-1666] and Velazquez in particular—shown by members of the controversial Munich School, a group of American led by Frank Duveneck [1848-1919], who enjoyed a considerable vogue in Boston, and by William Merritt Chase [1849-1916]. In fact, still lifes produced by Chase in the late 1870s and early 1880s (fig. 5) offer many parallels to those Carlsen began to produce in Boston shortly thereafter, having in common, apart from their subjects, a style that was more painterly than descriptive, dependent on effects of brushwork and theatrical lighting that cast some objects in shadow. 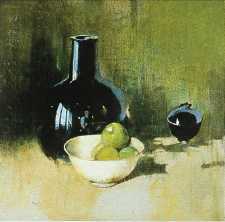 Such similarities underscore the fact that in eschewing the still dominant American tradition of trompe l’oeil still life, with its minute rendering of surface detail, Carlsen chose from the start to align himself with those seeking to establish new ground for American painting as a medium that combined both realism and personal expression. 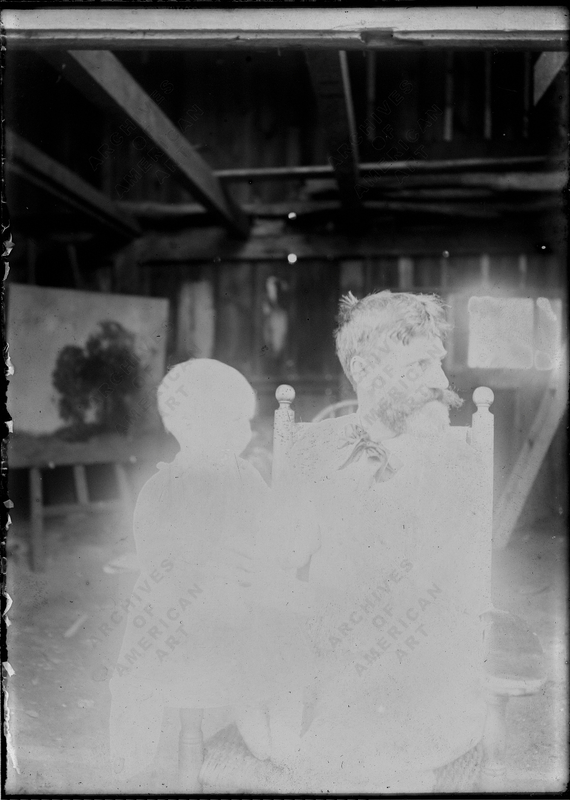 unresolved preoccupation, leading him at times to press foreground objects upon the viewer by bringing them to the very edge of the picture plane (plate 2), or distancing them through oblique recession into the background (plate 1). 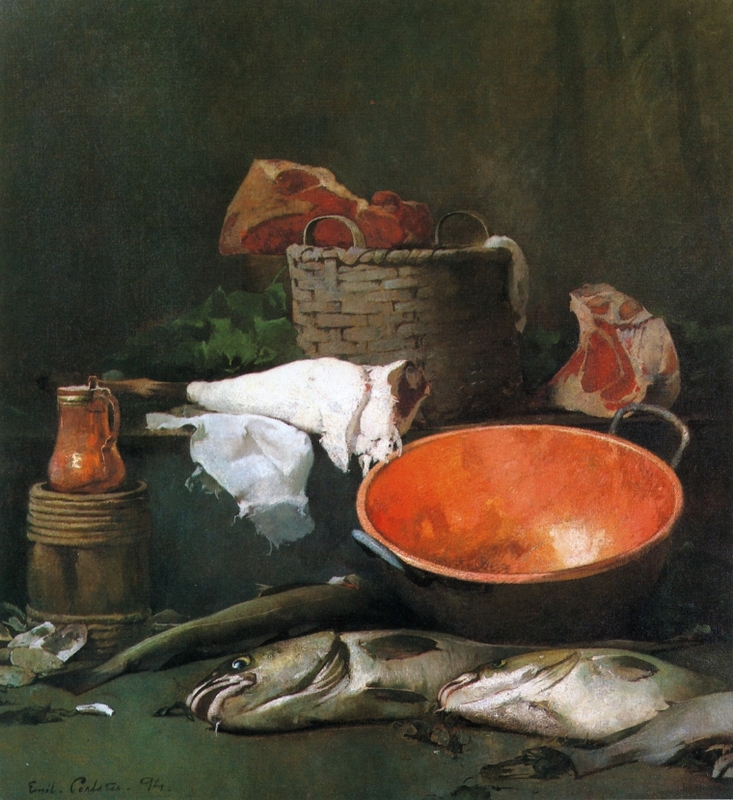 A common feature of the kitchen still lifes in which he assembled dead game, fish, and vegetables together with large platters and cooking pots of copper or brass, is the suggestion of a chance moment before the preparation of a meal with all its associations of abundance and anticipated pleasure. Their impact this relies in part, through implication, on the suggestion of human activity outside and beyond the scope of the picture itself. This is a significant aspect of Carlsen’s early works, one that recalls his seventeenth- and eighteenth-century models, that is later discarded in favor of subjects meant to survive wholly on their own internal aesthetic merits. The still lifes produced by Carlsen during his later Boston years were a critical and commercial success. In 1884 his two still lifes at the Boston Art Club exhibition were singled out in the Art Amateur as among the stronger works there (22), and it was reported that he acquired a small clientele of admirers in Boston and beyond. 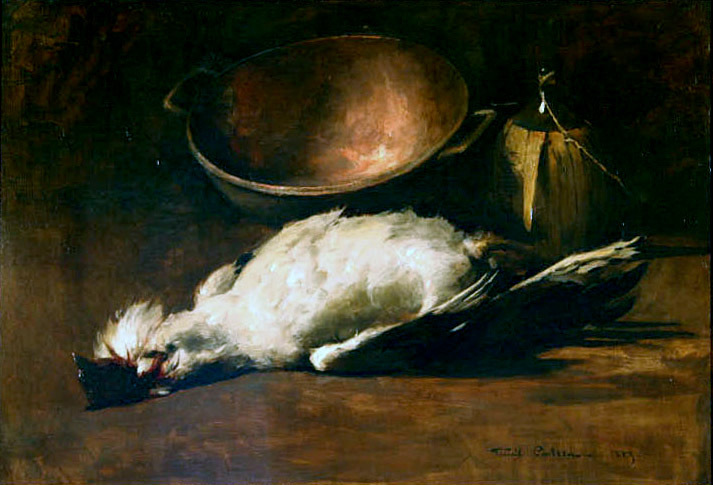 Among those who purchased Carlsen’s still life pictures during his Boston years was noted New York collector Thomas B. Clarke, who purchased in 1883 a sizable work described as “a study, in rich color and bold in handling, of a dead capon, a copper basin, and some kitchen accessories (23). Living in Paris near the Louvre, where he could admire and study Chardin, Carlsen tells many stories of still life painting—how at times they would eat the fruit, or mortgage themselves deeply to buy the flowers they needed. It was a this time he changed his palette and swung into lighter colors (25). are characteristically horizontal compositions, dark in tonality, and reveal an effusion of mellowed and burnished tints against shadowy surfaces and backgrounds. Carlsen painted the flowers with an impasto that approaches actual relief so that form is indissolubly united with surface. The delineation and perception of individual blossoms are subordinate to an overall sense of texture and mass, gravity and lushness. This effect is compounded by Carlsen’s tendency to horror vacuii, the filling of available space within the picture plane. While in Paris, Carlsen painted for dealers other than Blakeslee, and continued to paint still lifes of fish and kitchen settings in addition to flower subjects (26). In 1885 the artists succeeded in having one of his paintings accepted at the Paris Salon—Femme plumant des volailles—which was sold to the American collector George Seney and later owned by the actor/painter Joseph Jefferson. The original sale, Carlsen declared, provided him with “a bank account for one week.” (27) Along with what is presumably Carlsen’s Salon painting (fig. 10), there are several other analogous paintings from the 1880s and 1890s (fig. 9) that reflect the artist’s attempts to enlarge the scope of his still lifes into figured compositions—an area in which his lack of formal training perhaps showed most clearly. As recounted by Frederick Newlin Price, Carlsen’s arrangement with Blakeslee lasted for approximately two years before the artist tired of the monotony of such work. By sometime in 1885 or 1886 he had canceled his contract and returned home to America (28). Carlsen once again settled in New York, where he remained for about a year, working in a studio later used by his friend J. Alden Weir. 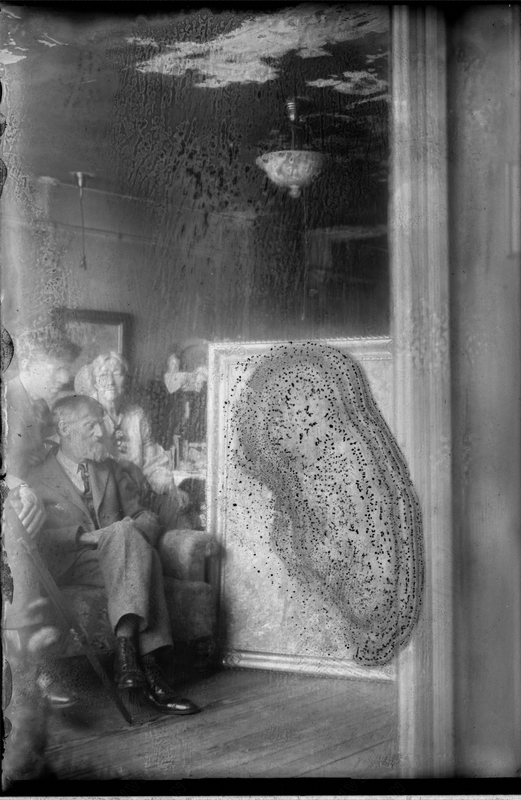 There he attracted the attention of Mary Curtis Richardson, a wealthy artist and patron from San Francisco, who offered him the directorship of the San Francisco Art Association School. He took up duties there in 1887 and although a popular teacher and member of several clubs including the Bohemian Club, Carlsen’s tenure in San Francisco proved anything but gratifying. Objecting to the management and funding methods of the school and the full-time commitment that teaching required, Carlsen resigned from the Art Association School by 1889, and subsequently took up teaching at the Art Student’s League where his friend and studio mate Arthur Mathews [1860-1945] also taught at the same time; together they shared a studio at 728 Montgomery Street (29). 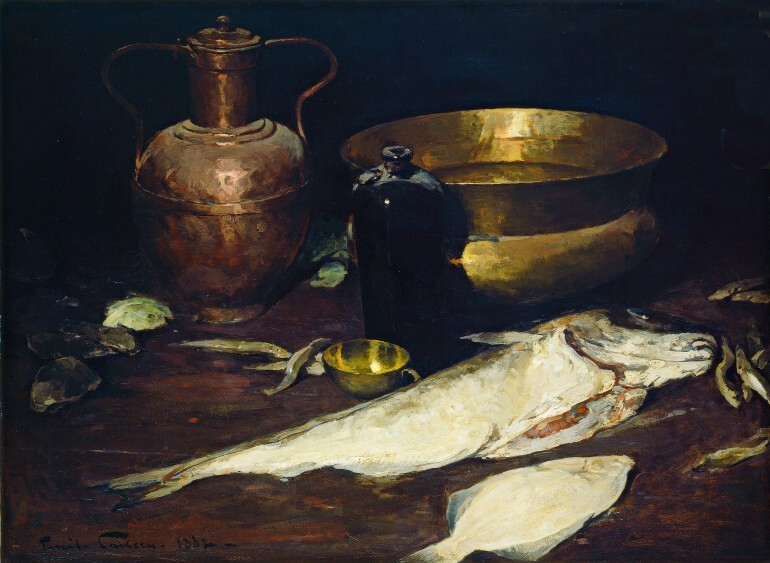 An otherwise unrecorded trip to Europe during his San Francisco years is evidenced by a still life of fish inscribed “Paris” and dated 1890 (36). It is a reminder of the frequency with which he must have traveled and how little is still known of these trips. The record of Carlsen’s San Francisco sojourn resumes in September, 1891 when newspapers reported that he had gone to the countryside earlier that summer but had returned in July. He was presently considering a return to New York (37). Carlsen soon made good on this prediction, bluntly declaring the reason for his departure, “I am going where people buy pictures, where there is an opportunity to exhibit them, and where a name means something. After two years, I find it unpleasant to be a pioneer in a place where the wealthier people get their pictures from Europe and the East, and the class of people that might like to purchase local paintings cannot well afford it (38). correspond approximately to his election as Associate of the Academy in 1904 and Academician in 1906 (40). Throughout the 1890s in New York, Carlsen kept himself very busy creating still lifes of unprecedented range and variety. He produced works of modest scale and classic simplicity (plate 8), others with a studied, humorous touch (plate 6), as well as extravagant exhibition pieces instilled with a sense of opulence and even a hint of bombast (fig. 13). Certain pictures recalled his earlier Boston work in their obvious thematic content, among them Thanksgiving Still Life of 1891 (plate 7), painted either in San Francisco or in New York just before the Thanksgiving holiday. Here the sense of a broader interior space including the delineation of a floor plane recalls his occasional figured compositions. 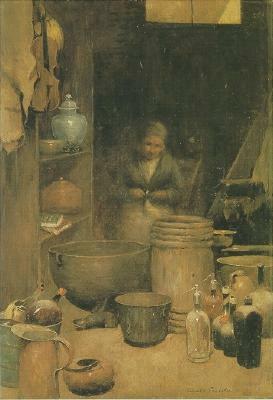 The plain decorated utensils and wooden barrel suggest an earthy, rustic atmosphere—a country kitchen with the homespun simplicity of bygone years, The deliberateness of this nostalgic, old-fashioned ambiance becomes clear when contrasted with other still lifes by Carlsen of about the same date. An example is the composition Cracked Ice (plate 15) which strikes a thoroughly modern note in its theme of a festive social gathering centering on an Oriental punch bowl flanked by cups, carafe and an assortment of liquor bottles. Here the idea of implied human activity intrudes to the point of becoming a distraction from the picture’s formal aesthetic qualities. represent Carlsen’s attempt to modernize still life formulas made popular in America from the time of the Peale’s and continued in the mid-nineteenth century by such painters as John F. Francis [1808-1886] (fig. 14). Flowers remain a popular subject with Carlsen during this period, however, with new emphasis on color that suggests the influence of Impressionism. The dark backgrounds of his earlier pictures gave way to greens, yellows, and reds, in particular (plates 5, 12 and 13). Also in these paintings the composition often reveals a greater structural clarity, with the objects and vessels no longer obscured behind blossoms, but given equal attention in the display. In a similar fashion individual blossoms tend to stand out, their buoyant colors made to contrast with equally bright surroundings. 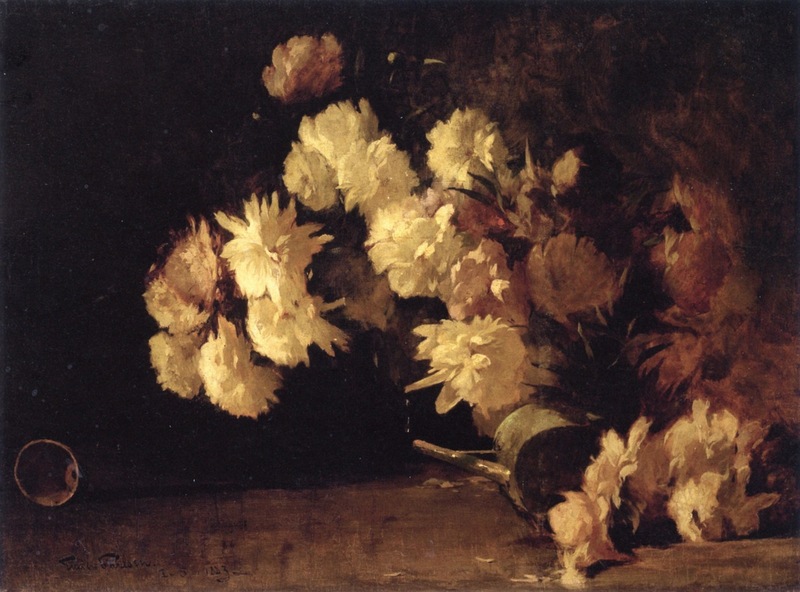 Chrysanthemums in a Canton Vase (plate 12) is one of a series of similar pictures from the mid-1890s in which Carlsen experimented with loose, impressionistic brush strokes. At the same time, Carlsen returned to the example of the old masters with variants of his kitchen table still lifes and in pictures of home and hunt centering on dead birds. These pictures rely for inspiration less on the model of Chardin than on the hunt trophy pictures of other eighteenth-century still life painters such as Jean Baptiste Oudry [1686-1755], Chardin’s greatest rival. 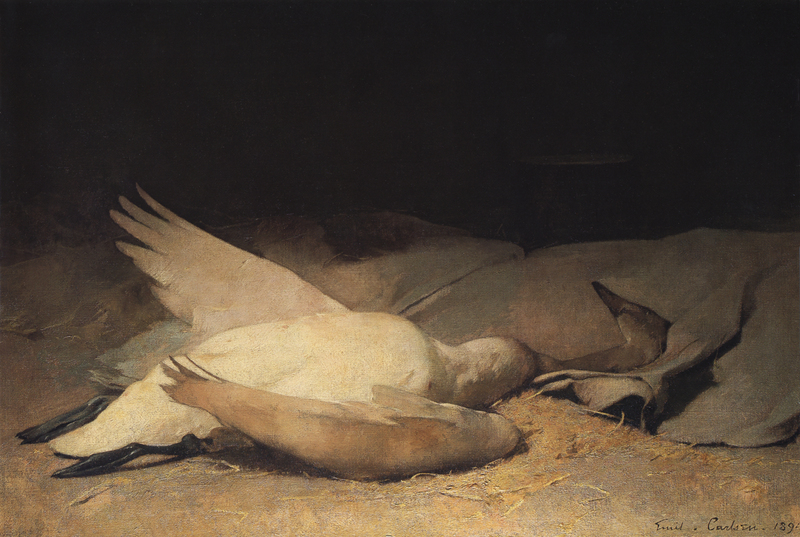 Analogous in a general way to Oudry’s still lifes with game, Carlsen treats the birds as aesthetic objects, whether poetic swan or barnyard fowl. Yet sometimes his animals suggest dramatis personae along with poetic allusion, Carlsen adding an occasional whimsical note where fish may express something like peevish indignation (plate 6), or roosters a state somewhere between pathos and absurdity (plate 9). Certain pictures combined the brighter palette with classical formulas such as in Red Jug and Chicken (plate 10) and Ruby Reflections (plate 14) where vivid reds highlight empty planes of light and shadow as well as the narrow horizontal surface that confine the objects. Carlsen painted a small number of these still lifes in pastel and watercolor, but didn’t pursue them for long, finding them poor mediums to accomplish what he wanted. In retrospect one can view the varied, experimental nature of Carlsen’s work in the 1890s as the necessary prelude to a final lasting reconciliation with his subject that began to take place around 1900. Although we know that an important transformation in Carlsen’s style took place around the turn of the century, the lack of dated works and documentation in general makes this change difficult to date or to explain. display of pure drawn lines and edges, seen in the complex outline of the delftware vase and the great ellipse formed by the rim of the larger of two bowls. Critics have always assumed that Carlsen’s early architectural training accounted for the precision of his drawing. Yet, if true an inclination long delayed since his paintings until about the turn of the century show little of the intense delight Carlsen finally revealed in rendering pure, crisp lines and the irregular geometric shapes and volumes that filled his later pictures. Carlsen selected his objects to explore every combination of curving shape and surface—circles, ovals, and ellipses. powerful force. Quite unexpectedly Carlsen’s work of representation is thus brought to the verge of abstraction. Other compositions of this period show a similar economy of means, even among more traditional subjects like that of Blackfish and Clams (plate 20). Although this composition again includes a variety of elements, they are presented in a notably more restrained, compact manner than had been true in previous work. 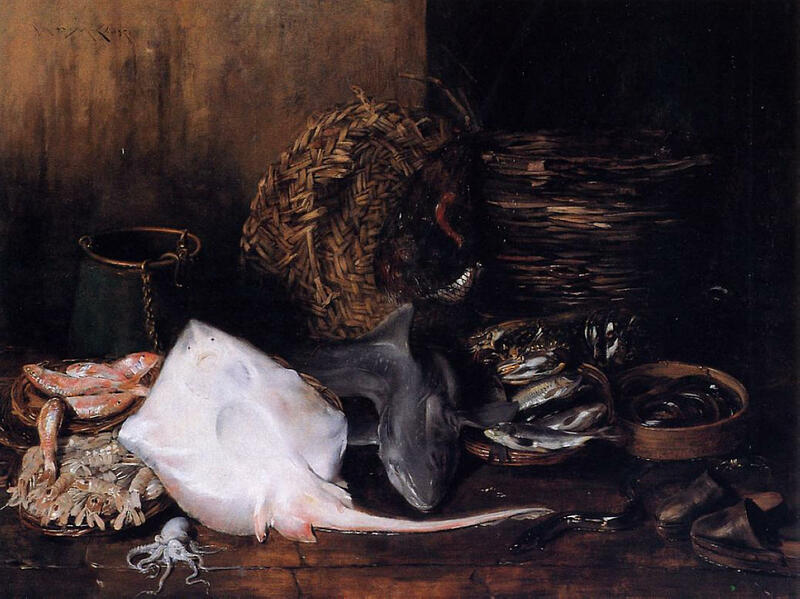 Fish and shellfish are here displayed along a narrow horizontal plane, while above them looms the centerpiece of the composition, a large, cloth-draped basket. 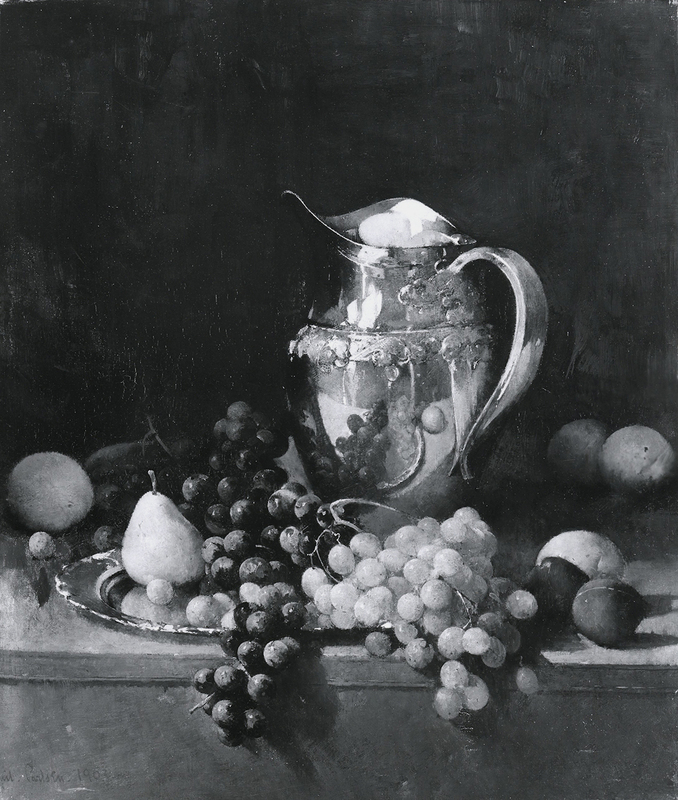 White cloths such as this appear repeatedly in Carlsen’s still lifes, providing the artist with opportunities to paint limpid, pliable forms with soft, reflective surfaces. While the authority Carlsen regularly chose to cite was Chardin, in the matter of his muted color schemes one also has to credit the influence of Whistler. Although Carlsen never mentioned him directly, his consciousness of Whistler as well as a hinted relationship is shown by some of their harmonies of color. Carlsen went so far as to rechristen one of his much earlier works Still Life and Symphony in Copper and Brass (fig. 6) (44) when it appeared in exhibitions in 1908/1909, and later works were given such Whistlerian titles as Arrangement in Gray, Violet and Green, Green and Gray, Green and Purple, Blue and Violet (45), also Blue, White, and Gold, or Blue and Gold (plate 28) and Blue and White (plate 30). 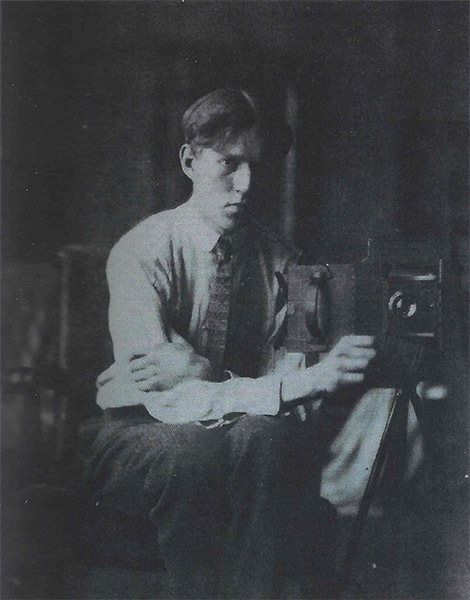 Dines Carlsen posed with his camera, c.1920 (fig. 20). 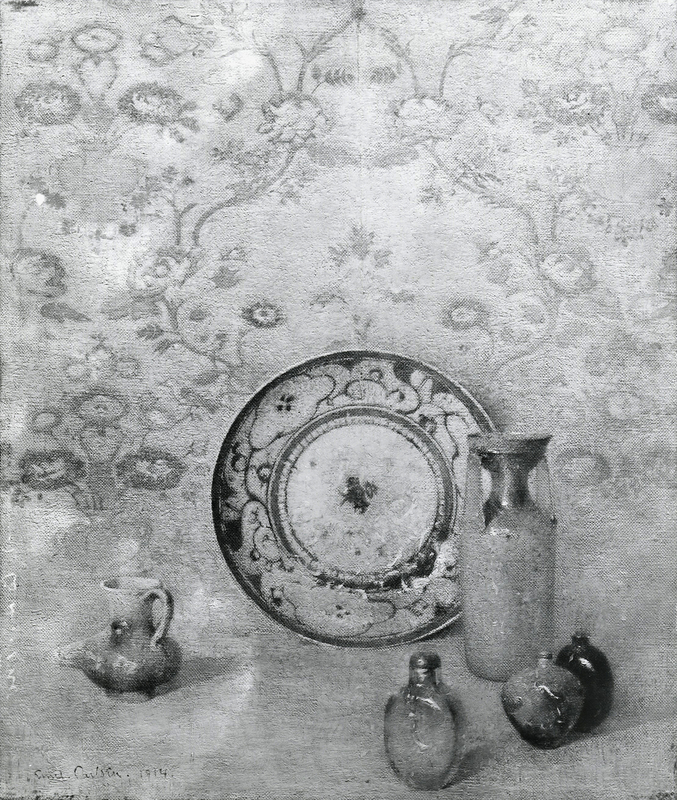 It was most likely Dines, perhaps to provide an analytical aid, who recorded this unique photograph of an Emil Carlsen still life arrangement (fig. 21), which the artist subsequently rendered in paint (fig. 22, location unknown). 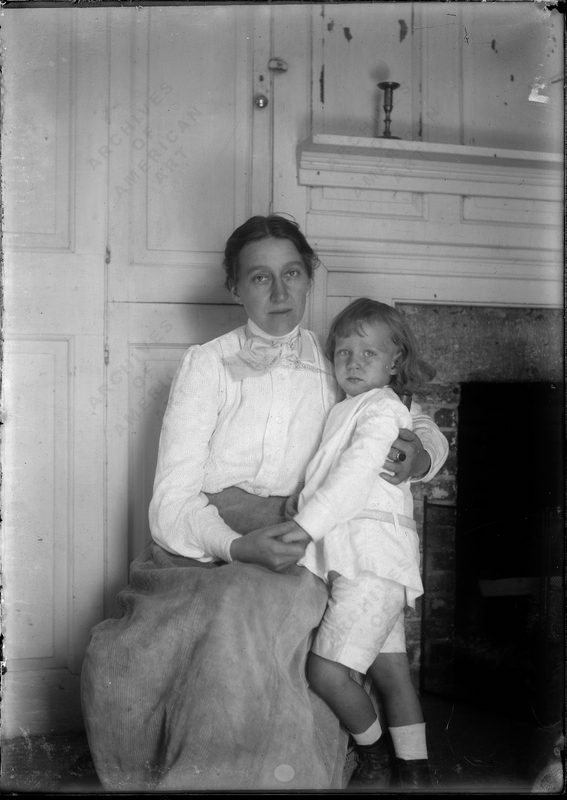 These images were part of the Carlsen family’s collection of photographs. 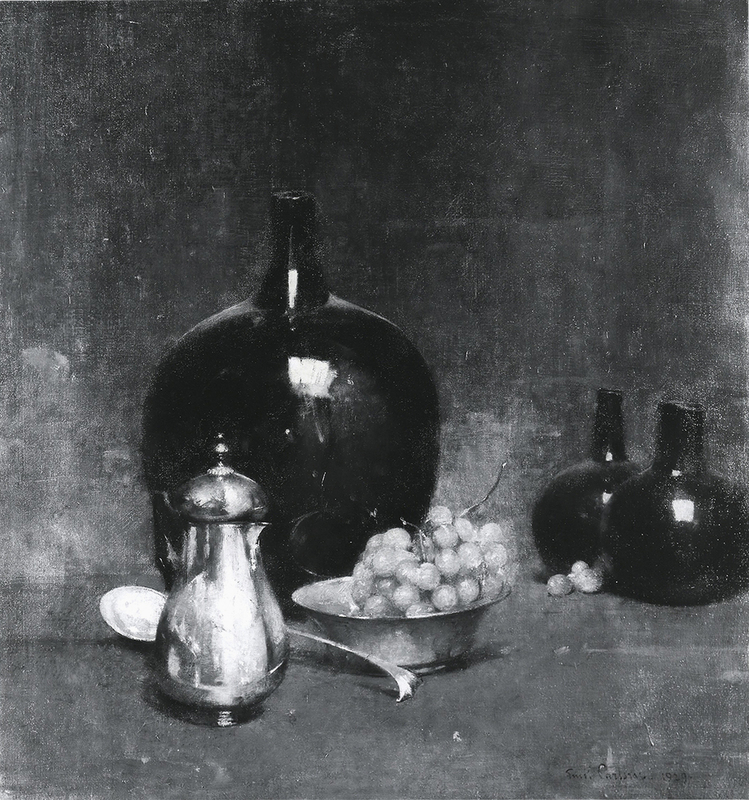 The source of much explicit information about Carlsen’s paintings is the essay “On Still-Life Painting,” written by the artist in 1908 (see Appendix I), and marking the climax of his artistic development. It is not the essay per se which determines this, but rather the work which by this date stood behind it. In his essay Carlsen speaks with the confident voice of one who has finally mastered his discipline, setting forth practical advice underlain by profound idealism. Aimed at students engaged in learning the art of painting, “On Still-Life Painting” also stands as an autograph tour of Carlsen’s own working methods. Through it, one traces in an accurate, if simplified manner, the sequence the artist followed in creating his still-life compositions. 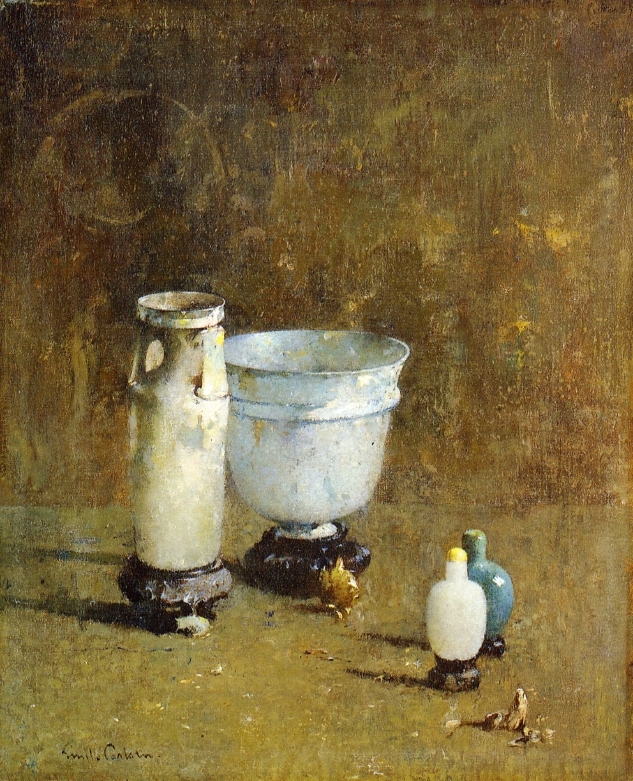 The first step involved choosing interesting objects which were required to be “good in color and form.” Before commencing painting, the values had to be decided—the amount of light and shade in the objects and background—and after that, the range of colors which Carlsen preferred to limit. To the greatest master, as to the beginner, there is one problem to be met in every study, simple or elaborate—that is the study of values. This technical phrase means the amount of light and shadow in the object drawn or painted, and the amount of light and shade against its background, simple enough to understand and solve in a drawing of a white cast against a white background, difficult in objects containing local color. In his writings, Carlsen was concerned mainly with general principles: what he failed to address were some of the very personal predilections that he possessed to an extreme degree. The most important of these was his interest in the rendering of surface values and the relationships of surface to modeling. 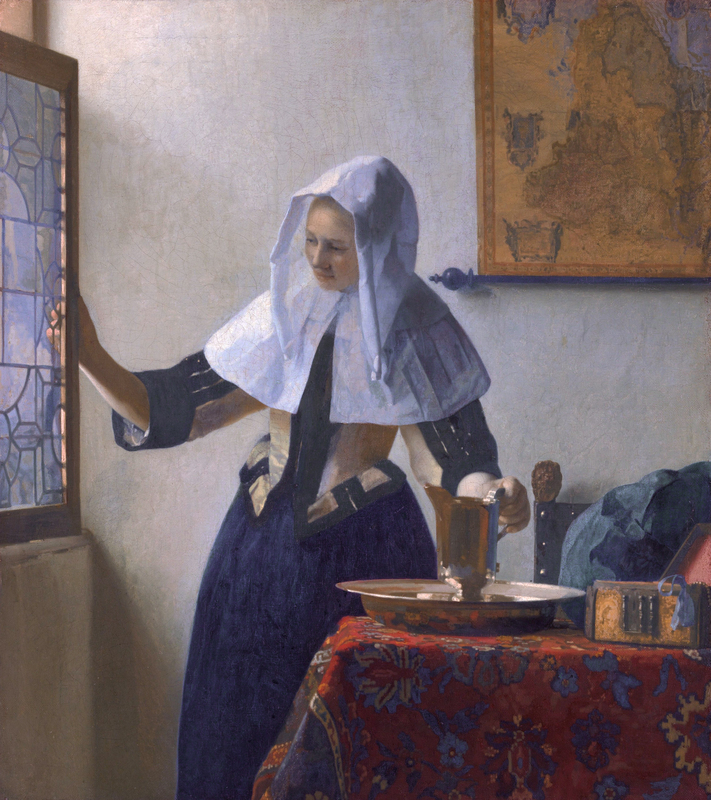 Carlsen acknowledged this matter in part through his focus on values as the key to painting. He observed that masters such as Vollon, Bail, and Chase preferred to emphasize the transient effects of surface highlights—the light which exists, so to speak, as a “suggestion” above and detached from the actual surface itself. 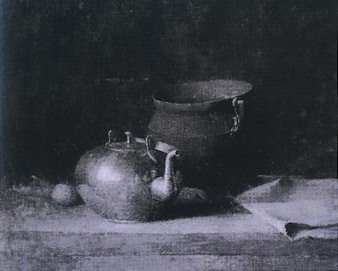 By contrast, Chardin (and Carlsen himself) chose to subordinate this “glitter” to the surface: “The polished surface of a copper pot can be painted.” Carlsen said, “but the painter must choose his key and subordinate either surface or high light.”(49) This is consistent with Carlsen’s sense of underlying three-dimensional order, for he understood the surface to be inseparable from the construct of the object itself: obscuring bright highlights would threaten the solidity of the three-dimensional object. One finds, for instance that whatever the color or the texture of his surfaces, whether representing smoothly polished metal, translucent ceramic glazes, or woven cloth, the intricate portrayal of surface is never allowed to interfere with the underlying sense of volume and solidity. 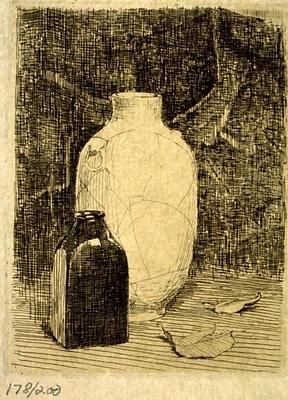 Still Life with Vase and Bottle, etching, 3-7/8 x 3 in. Carlsen’s brief experiment with etching produced these still-life image s, which were printed posthumously. 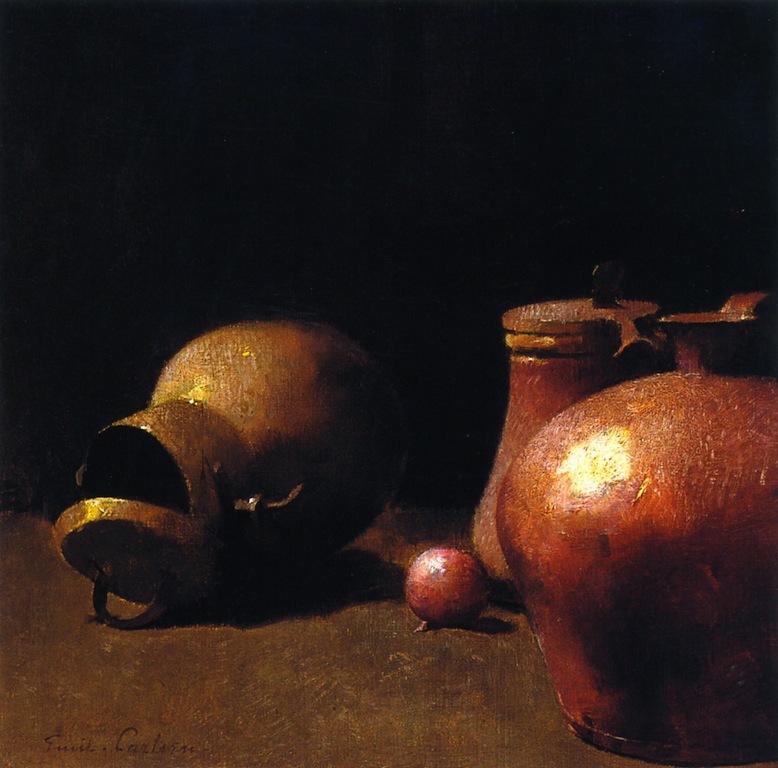 Of course, the juxtaposition of different shapes and their spatial relationships was a fundamental ingredient in all of Carlsen’s still lifes, but the contrasts in surface color, texture, and light that he explored within individual compositions is one of his most extraordinary achievements. These may take the form of subtle, closely related values, as between polished brass and oxidized copper (plate 25), between the dusty hues of blue-black bottles and creamy white glazed porcelains with their time-stained chips and repairs (plate 31); between the textures of organic and inorganic materials such as polished brass, leathery stoneware, linen, garlic (plate 24) or silvery metal, transparent glass and papery shallots (plate 27), or finally between close harmonies of color itself (plate 26). 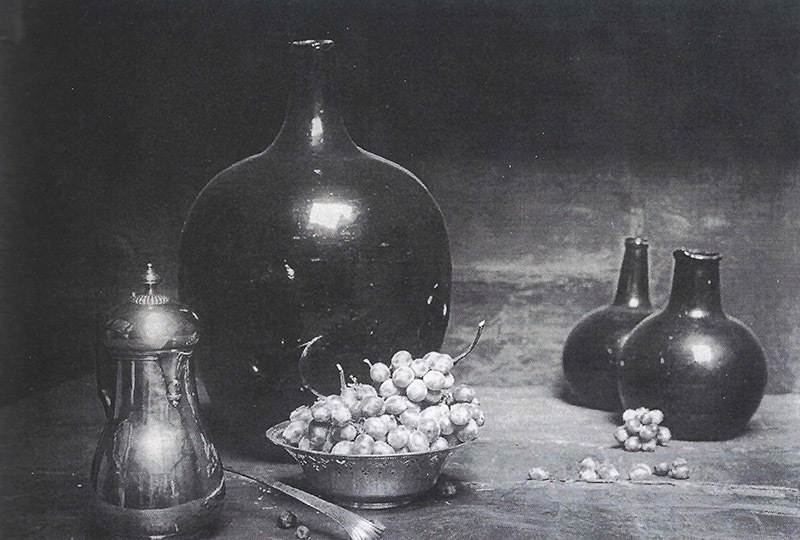 Carlsen’s triumph in elevating his still lifes to a unique personal idiom is nowhere better illustrated than in the masterful Still Life with Pottery Jars of 1903 (plate 22), a composition whose exquisite control reveals a sense of classical balance and harmony. The dominant note is struck by a stately white ceramic jug, whose smooth spherical surface represents a tour-de-force of textural painting. 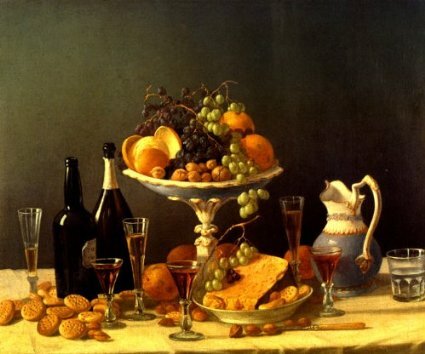 Arranged around it are objects in ceramic, metal and glass varied in shape and color, and a spare arrangement of grapes, walnuts and lemons, with the latter providing a high note of color. The partially peeled lemon in the foreground its skin trailing downward in an elegant, curving volute, is an obvious historical reference to such familiar objects in Dutch seventeenth-century still life paintings, without in any way being directly imitative, Carlsen’s viewers would have understood the reference, the learned context it provided, as they would have appreciated its central role in the plan of the picture with its calculated contrasts of verticals and horizontals, of curving forms and separate surface textures and colors. Carlsen’s so-called Study in Grey (plate 26), like Pottery Jars also defines a clear horizontal space between the picture’s frontal plane and background, which is here artfully constructed of wooden planks and molding. Placed alongside a great black iron tripod kettle—one of Carlsen’s favorite objects—is an eccentric brass kettle with complex fittings on its lid and a slender curving spout, together with an earthenware jug, small porcelain bowl, and a linen cloth. The palette is confined in the most deliberate manner to variants of gray along the spectrum of white-black-grey-brown, a color range that produces a certain forlorn quality expressive of a storage shelf. These two paintings comprise part of a small group of related, and equally beautiful, still lifes in which a relatively large number of objects is disposed horizontally along a shelf whose front edge intersects the picture plane (fig. 24; plates 22 and 26). In these works, the artist crossed a critical line through his capacity to impart to the assembled objects the sense of a world existing unto itself, an independent, artificial domain governed and informed by the aritst’s personal vision. Increasingly in the still lifes painted by Carlsen after about 1900 the idea of finding beauty in ordinary objects gives way to a highly selective search for articles of extraordinary design and even historical association. His objects may still represent the materials of daily living, but now each is selected for some telling characteristic of shape, construction or surface value. 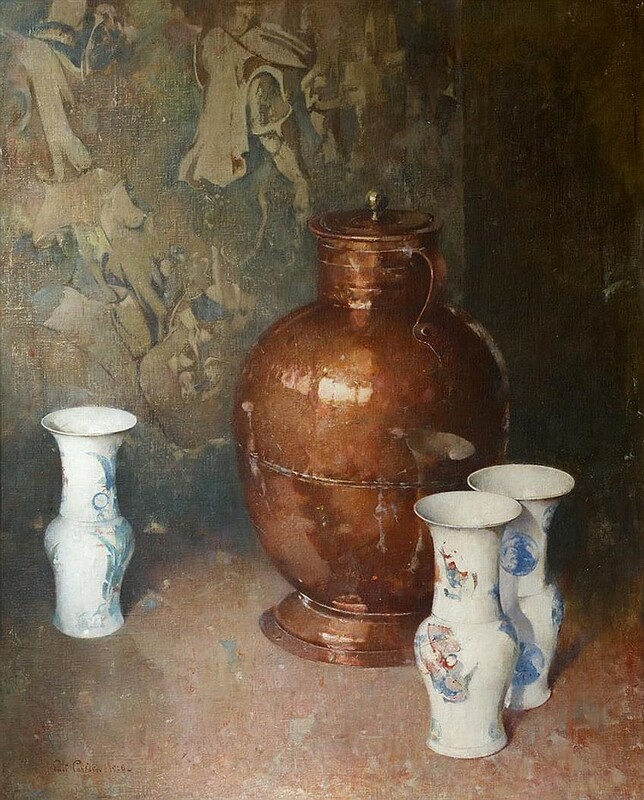 Old copperware and ceramics played a supporting role in Carlsen’s paintings from the beginning, but here the artist develops a positive antiquarian turn, emphasizing the age and condition of such articles as antiques with their own intrinsic aesthetic qualities are savor of the past. Anonymous functional kitchenwares—copper platters and plain earthenware jugs—give way to hand wrought copper and brass tea kettles and chocolate pots, sturdy Leeds tablewares with their creamy surfaces and distinctive shapes, and dainty Oriental porcelains painted and glazed in delicate shades. Some favorite items appear over and over again in his paintings, such as chocolate pots (fig. 27; plates 24 and 42), a painted Chinese tea cup (plates 16, 21, 22 and 28), a time-stained porcelain bowl (fig. 23; plate 26), and what Carlsen called his “Spanish Brazier” (figs. 1, 28, 29), Carlsen embracing the specific identity and craftsmanship of these objects. The man-made object gradually comes to predominate in his still lifes, while natural objects—fish, game, flowers, fruits, etc.—eventually either disappear from his repertory or play very minor roles. An exception is his perennial use of the humble onion or garlic whose usefulness as a point of light and whiteness never diminished. reversed, and in the ensuing fifteen years all but two of his twenty-three exhibits at the Academy were either landscapes, marines, or an occasional figure piece. Thus it was that by virtually ignoring the genre that had established his reputation, and by developing an alternate specialty in landscape and marine painting, Carlsen finally placed his career on solid ground. In 1905 he was able to buy a house in Falls Village, Connecticut, where he subsequently spent spring and summers when not traveling. His regular schedule also included trips of a month or longer each autumn to paint the sea at Ogunquit, Maine (fig. 30). One result of Carlsen’s new-found success as a landscape and marine painter was a series of one-man shows. The first of these appears to have been held at the Bauer-Folsom Galleries in New York in March and April, 1909, the principal subjects being marines and landscapes painted in Denmark, Venice, and New England. Of sixteen canvases exhibited, only one was a still life (which depicted a Gothic Descent from the Cross in carved wood). (61) Among the purchasers of his marines where the noted collectors George A. Hearn (who bought The Blue of the Ocean and Moonlight at Kattegat), and William T. Evans who purchased The South Strand for the collection he was creating for the National Museum in Washington. (62) That year (1909) Carlsen also exhibited one of his marine paintings (Alta Marea) at the Biennale in Venice, where he had visited the previous year. The chronology of Carlsen’s still lifes in the decade between 1910 and 1920 is obscured by an exceptional scarcity of dated works, although a terminus ante quem for some paintings is provided by the exhibition at Macbeth in 1919 of Robert Handley’s collection and by illustrations of Carlsen’s work in Edwin Arthur Bye’s book on still life in 1921. The extant dated still lifes provide important benchmarks for Carlsen’s development, but they also underscore the fact that the line of his advance was not necessarily straight. By its very nature, still life summoned in Carlsen the need for variation and change; nonetheless, themes once mastered might be left off and then revisited after a time, resulting in the intermingling of seemingly divergent styles within any given period of time. into actuality as the background is depicted as an embroidered material of Oriental design. This emphasis on flat, patterned surfaces became increasingly evident in Carlsen’s work. As in other Oriental still lifes, the picture also includes an ancient Roman glass vase. Carlsen evidently enjoyed the juxtaposition of Eastern and Western elements, emblematic of two admired ancient cultures (figs. 34, 39; plates 29, 30), as well as the pictorial possibilities inherent in the iridescent multi-colored surfaces of silk and glass. One also notes the presence of flowers in a number of these paintings, though no longer rendered as bright, living blossoms but as relics shriveled and dried with age. Other pictures featured as their central element open painted fans, both Oriental and Western origin, usually set before light, textured backgrounds stamped and scrumbled over with ornamental designs (plates 31 and 32). The geometric arc of the open fan that insistently stresses the two-dimensionality of the picture plane provides the leitmotif of these compositions, signaling Carlsen’s growing interest in the relationship between illusionistic space and surface. Oriental themes comprise only one of several new still life categories that centered on foreign works of art or precious objects of vertu. By 1909 Carlsen had borrowed from a friend’s studio an antique wooden relief representing the Decent from the Cross that formed the background in a still life shown at the Bauer-Folsom Galleries. 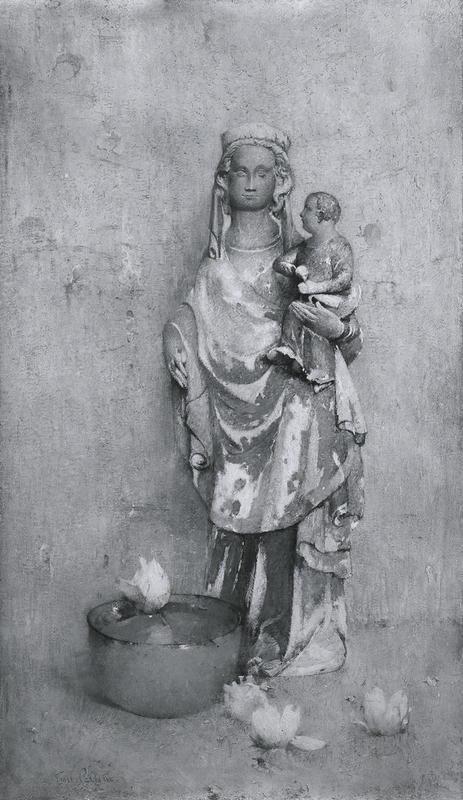 (81) Subsequently, a medieval statue of the Virgin and Child provided the subject for a painting known as The Madonna of the Magnolias (fig. 35). The use of such figural sculptures was matched in his Oriental still lifes by Chinese jade figures of scholars or sages and Japanese netsuke. From about 1920 until the end of his life, Carlsen used such exotic and rare materials in increasingly elaborate and fanciful combinations. His painting Mandarin Beads of c.1920 (fig. 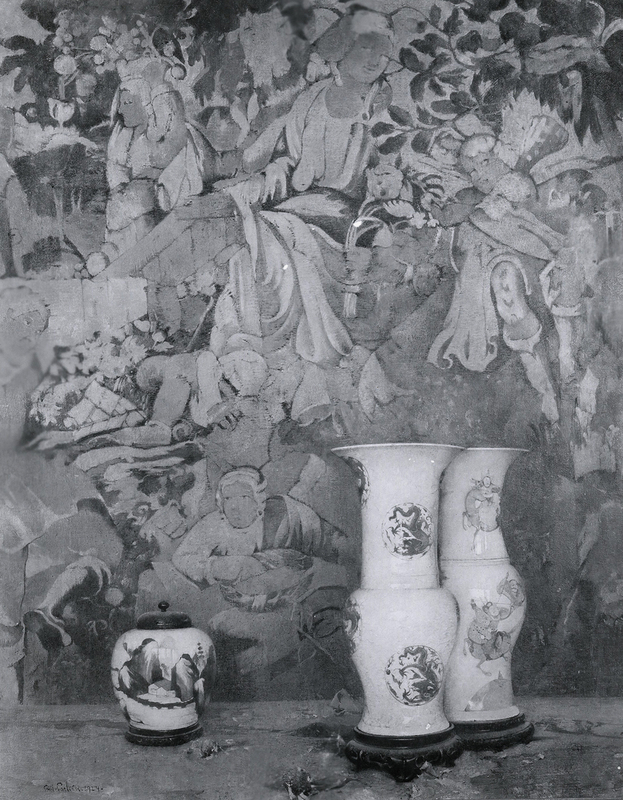 40), while repeating the same vase and dried flowers arrangements used in earlier compositions, shows a new willingness to test the boundaries between illusionistic representation and decoration. The backgrounds of still other compositions were elaborately filled with a favorite Flemish tapestry that he owned (figs. 1, 41, 42) or with paintings of Eastern origin. 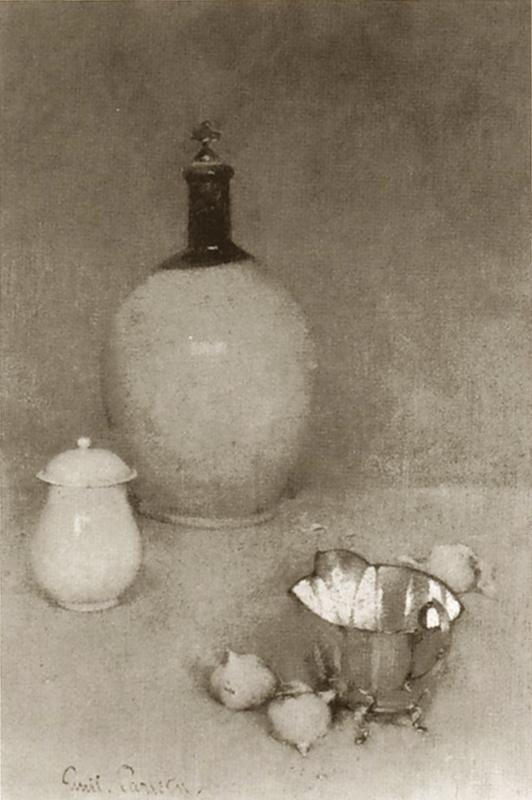 As Carlsen’s title for one of these, Picture from Thibet (plate 40), suggests, the still life could at times emerge as the picture of a picture. Such elaborate pictorial still lifes stood in sharp contrast to the spare, discrete compositions of earlier years, which Carlsen continued to produce in decreasing numbers through the 1910s and 1920s (figs. 29, 43, 44; plates 37,38,39, 41). (1) Emil Carlsen, “Weir the Painter,” in Julian Alden Weir, An Appreciation of his Life and Works, The Phillips Publication, New York, 1922, p.50. (3) Emil Carlsen, “On Still Life Painting.” Palette and Bench 1 (Oct, 1908), p. 6. (5) Carlsen was a member of the following organizations: Paint and Clay Club, Boston; St. Botolph Club, Boston; Bohemian Club, San Francisco; Society of American Artists; National Academy of Design, Associate (1904), Academician (1906); National Institute of Arts and Letters (1906); Lotos Club; Salmagundi Club; Century Association; American Federation of Arts; Art Club of Philadelphia; Fellowship of the Pennsylvania Academy of the Fine Arts. (6) Worstman-Rowe Galleries, The Art of Emil Carlsen, 1853-1932, San Francisco, 1975, p. 8. (7) Elizabeth Luther Cary, “Quietness and Slow Time: Carlsen’s Heritage Expressed Itself Tellingly In Beautiful, Accomplished Painting,” New York Times, Jan. 10, 1932, section VIII, p.11. “Right on time, even a bit early, Mr. Carlsen was announced and I was surprised to see a spry gentlemen, who appeared to be about 65 years old, well dressed, but very, very plain, a big blondish beard and wearing glasses, everything pointing to a sturdy personality that has stayed true to itself. 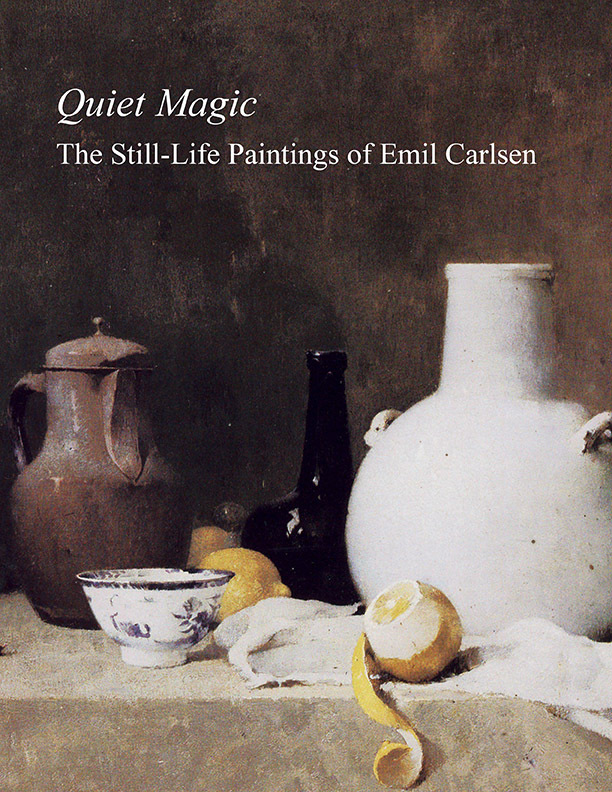 You know Emil Carlsen is a big name and I had expected to see quite the contrary. I had expected to see a highbrow, a man well groomed, paying much attention to his exterior, unapproachable, but fame and prosperity have not contaminated this man’s soul…He has retained an exceptionally clear mind. There is nothing affected about him—simple and true—no fringes.. A man who has gone through as much as he has and remains uncontaminated, certainly again proves that greatness and simplicity come from the same root. “…During the conversation I mentioned that I did not have an “Emil Carlsen” in my collection, that once in Los Angeles I saw a beautiful little still life—a bluish vase and a little mannequin in the corner—it was very small, measuring about four by seven inches, and the price was $700. “Oh yes,” said Carlsen, “I used to paint those in the days when we had but 15¢ for our meals and glad to have the 15¢. I used to paint those things for $5.00 a piece and told the people they could come around in the afternoon to call for them.” Then he related how recently he refused $15,000 for one of his paintings. “Speaking about galleries, he believes the Rehn Gallery is the one for us to get in and as I told you I believe Mr. Rehn sufficiently enthusiastic about your work to take you on later in the Fall. Mr. Carlsen mentioned the Ferragil [sic] Galleries, who Mr. Carlsen and somebody else put on the map. He mentioned them as a probable other gallery that could handle your pictures, to he did not like them any more. When I told him they asked us $5,000.00 for a show, he related his own experiences of why he does not like them anymore and that is after having helped them, seeing that they had one of his early paintings, a small portrait of Mr. Carlsen’s boy which Mr. Carlsen would have liked to get back, he had to pay them $3,000.00. “With regard to Milch Gallery, these people made Mr. Carlsen pay twice for a frame. He once ordered a frame for $80.00 and paid cash for it, because he does not run any accounts anywhere, but pays cash. He was sent a statement at the end of the year and was forced to pay once more. Mr. Carlsen states that the Milch Gallery, if they take our pictures, may take them, but put them on the shelves and they will be buried there forever. Yet, the same, I may leave a few pictures. “Something else interesting related by Mr. Carlsen, was that not very long ago he came across three of his very early pictures which he did not think so much of—so he bought them back for $1,100.00, took them home and cut them up as he did not care to have them in the market anymore. (9) This fact is clear from Carlsen’s correspondence with several former students (see below notes 42 and 47), and is remarked in a letter written by his son Dines to Helen Elizabeth Keep, Jan. 10, 1932: “I greatly appreciate your letter of condolence; from one who understood Father’s work, and regret that you will never met him, as he always gave his sincere help to those who sought his advice regarding their canvases, his constant effort was to impart as much of his knowledge as he could to the earnest student, never withholding any secret of technique.” Archive of American Art, reel D8. John Andrew Myers, in charge of the teaching program at the Pennsylvania Academy of Fine Arts, complimented Carlsen on March 26, 1915 with these words: “You are an inspiration to [the students]…You are a teacher by nature and are making just as good pictures by your influence upon others as those even which you paint yourself directly on canvas.” Archives of the Pennsylvania Academy of the Fine Arts. (10) Carlsen to Claude Buck, Mar. 1, 1927, Archives of American Art, reel 2982. (11) Royal Cortissoz, as quoted in Brooklyn Daily Eagle, May 5, 1935. (12) Carlsen to the Macbeth Gallery, July 6, 1922, Archives of American Art, reel NMc31. (14) There is conflicting information regarding Carlsen’s date of birth and early training. Philip Weilbach’s, Nyt dansk kunstnerlexikon, Copenhagen, 2nd ed., 1896-97, vol. 1, p. 147, which is the first biographical source to list Carlsen, gives his birth date as October 19, 1848, and further states that he studied architecture in Copenhagen with Johann Stillman, at the Technical Institute under Ferdinand Vilhelm Jensen, and at the Danish Royal Academy between 1868-1872. These dates have become generally accepted. Confirming the earlier birth date, however, is the account written by an acquaintance of Carlsen’s stating that the artist admitted to being seventy-eight years old in January, 1927. (see n. 8). According to that statement, Carlsen’s birthdate would indeed have occurred in 1848. The artist stopped using his given name Soren in the 1880s. 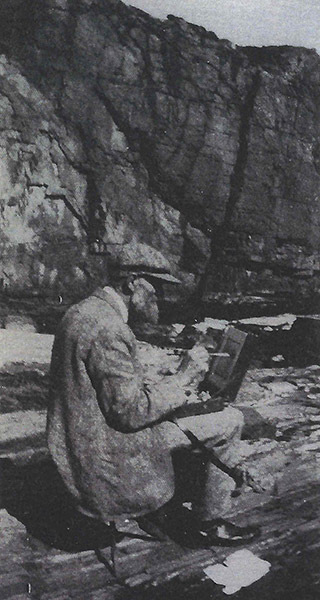 (15) In F. Newlin Price, “Emil Carlsen—Painter, Teacher,” International Studio, 75 (July 1922), p. 300, Carlsen is said to have made some marine sketches in Denmark—including at Elsinore—before coming to the United States. (17) Hassam recounted: “I worked steadily in the life class. I worked out of doors everywhere that I could. About this time I met Emil Carlsen, who was a young Dane, who had just come to Boston. I met him not long ago, and he told me he remembered me since I was in knickerbockers in Hyde Park. You know, Hyde Park is a suburb of Boston. [Edmund Henry] Garrett [1853-1929] knew Carlsen. Whether I met him with Garrett or not I do not know. Carlsen, among the painters, is the oldest friend I have, who is still living. You see, this young Dane came through Boston to make his way, and he made drawings, I think, for John A. Lowell the steel engraver, and with Carlsen I was making these very careful architectural designs for John A. Lowell, who was identified with the Fine Arts and tried to do something for painting.” from Dewitt Lockman Papers, Interview with Childe Hassam, Jan. 31, 1927, New York Historical Society (microfilm copy in Archives of American Art, reel 503). (18) King’s Dictionary of Boston, 1883, p. 350. (19) In the exhibition catalogue Carlsen’s address is given as 27 Tremont Row. The artist waited until 1898 to exhibit there again. (20) For an early street scene inscribed “Paris ’76”, see, American Art Association, Feb. 15, 1922, no. 10. 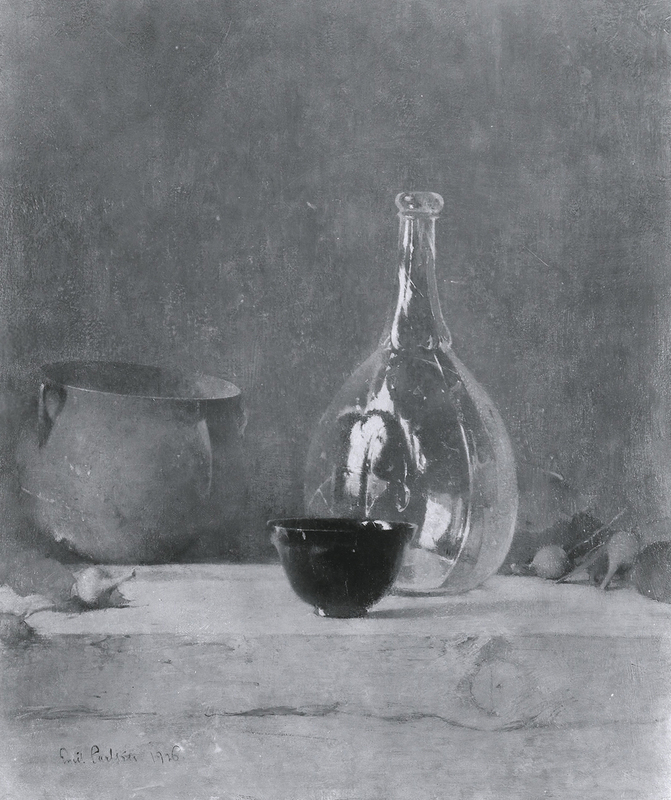 (21) For the Chardin revivial, see, Chardin and the Still-Life Tradition in France, by Gabriel P. Weisberg with William S. Talbot, The Cleveland Museum of Art, 1979. For Chardin see Pierre Rosenberg, Chardin, 1699-1779, exh. cat., Reunion des Musees Nationaux, Paris, Grand Palais, Paris, Jan. 29-Apr. 30, 1979 (also shown at Cleveland Museum of Art and Museum of Fine Arts, Boston). (23) See, Catalogue of the Private Art Collection of Thomas B. Clarke, Feb. 14-17, 1899. American Art Association, New York, no. 30; see also pp. 30-31. (24) See, Elizabeth de Veer and Richard Boyle, Sunlight and Shadow: The Life and Art of Willard L. Metcalf, New York, 1987, p. 36; see also p. 39, fig. 35 for Metcalf’s watercolor portrait of Carlsen. At least one reminder of this sojourn remains in a painting by Carlsen titled Courtyard at Grez: Inventory of American Paintings, no. 80043579. (25) Price, op. cit, p. 308. (26) These include Fisherman’s Table dated “Paris [Nov.] “84” (Doyle’s, Dec. 4, 1991, no. 22) and The Root Cellar incribed “Grez 84” (Christies, Sept. 30, 1988, no. 126). (27) Price, op. cit, p. 305. (28) Price’s time frame may be somewhat exaggerated: The painting Still Life with Oriental Vase inscribed “Boston 1884” (Christies’, Dec. 2, 1988, no. 144) demonstrates that Carlsen was still in American during part of that year; his return to New England sometime in summer or autumn of 1885 is suggested by a large landscape inscribed “Cape Ann Sands 1885” (Sotheby’s Dec. 5, 1985, no. 176). (29) For details of his San Francisco years, see Gene Hailey, ed., California Art Research Project, vol. IV (Jan. 1937), pp. 27-63; 1st Series, Abstracts from Works Progress Administration Projects 2874, San Francisco 1936-37, pp. 27ff. (Archives of American Art, reel NDA/Cal 1). (30) San Franicisco Chronicle, June 16, 1889, as quoted in Hailey, op. cit., p.35 ff. (31) Idem. Carlsen is listed as a member of the Society of American Artists in 1889, as he had been in 1888. Thereafter his membership lapsed until it was again resumed in 1902. During the interim Carlsen continued to exhibit regularly in the Society annual exhibitions, an indication that the reason for his absence from the membership rolls was financial. (32) From an unidentified newspaper article, cited in Hailey, op. cit., p. 40. (33) San Francisco Chronicle, Aug. 11, 1889, and Aug. 26, 1889, as cited in Hailey, op. cit., p. 36. (34) San Francisco Chronicle, Sept. 22, 1889, and Oct. 27, 1889, as quoted in Hailey, op. cit., p. 37. (35) San Francisco Chronicle, Nov. 11, 1889, as quoted in Hailey, op. cit., p. 37. (36) See illustration in Weisberg, op. cit., p. 59. (37) San Francisco Chronicle, Sept. 27, 1891, as quoted in Hailey, op. cit., p. 38. (38) Unidentified newspaper article, cited in Hailey, op. cit., pp. 39, 40. (39) His addresses listed in Trows New York City Directories include the following: in 1893 at 106 W. 55th St.; in 1894-95 at 23 E. 14th Street; 1897-99 at 59 Washington Square South; 1901 at 149 W. 23rd Street, NY; by 1903 he is listed at 43 E. 59th Street. (40) I am grateful to David Dearinger, curator National Academy of Design, for his information. 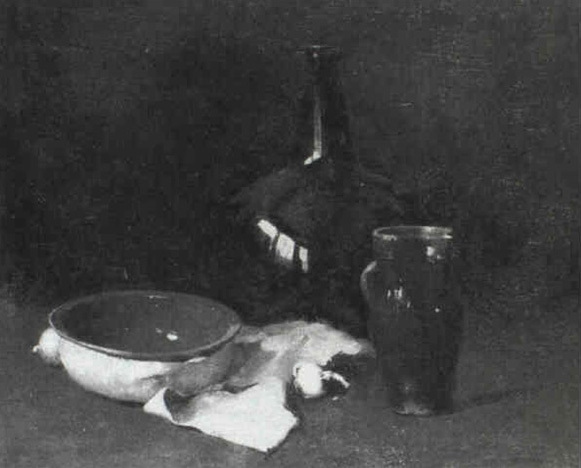 (41) Emil Carlsen, “On Still-Life Painting.” Palette and Bench 1 (Oct. 1908), p. 7. 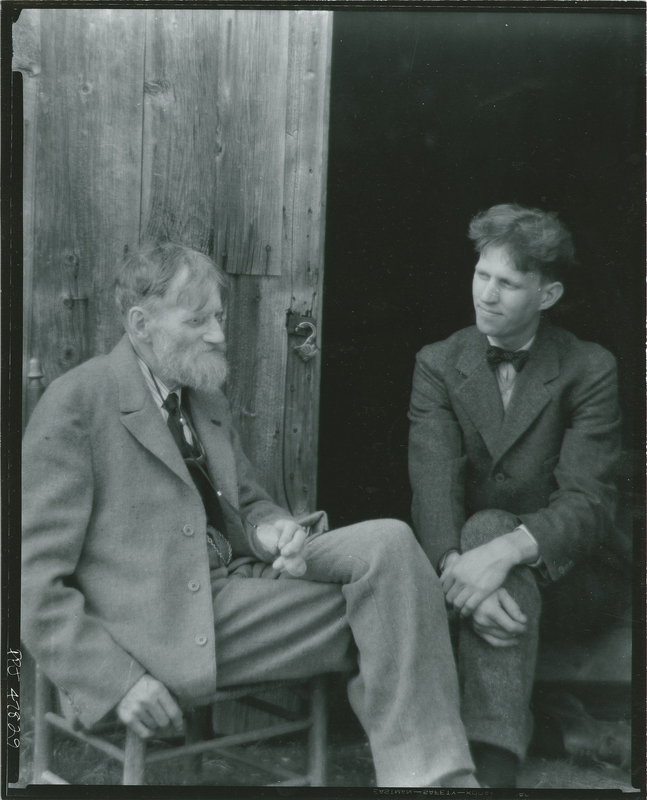 (42) Emil Carlsen to Helen E. Keep, July 3, 1930, Archives of American Art, reel D8. (43) Carlsen, “On Still-Life Painting,” p. 6. (44) National Gallery of Art, Washington; see, Franklin Kelly, et. al., American Paintings of the Nineteenth Century, Part I, National Gallery of Art, Washington, 1996, p. 46. The picture was shown at the Boston Art Club in 1909 and at the Corcoran Gallery in 1908-09. 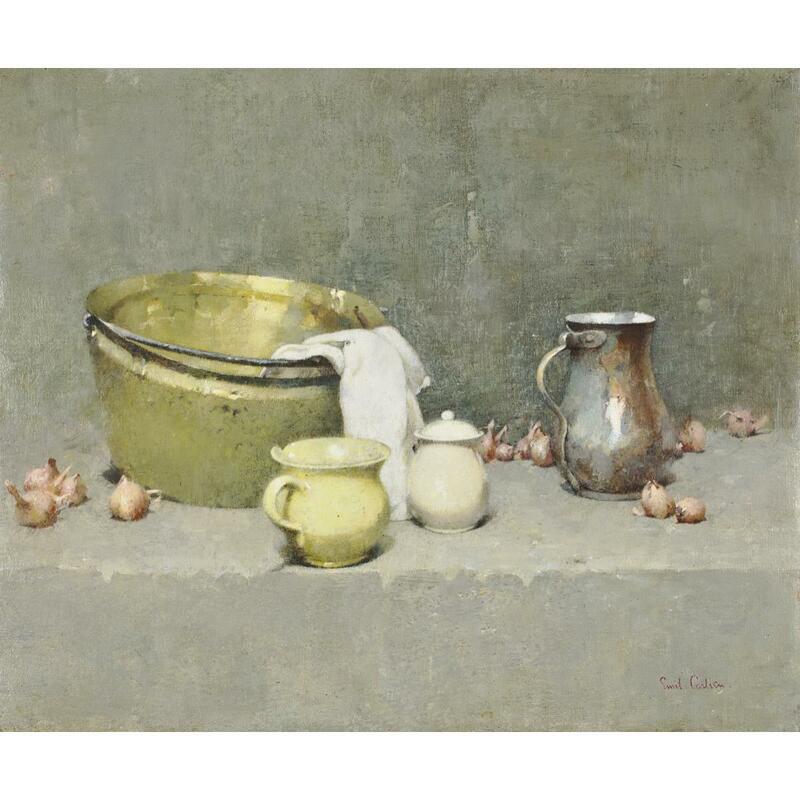 (45) See, A Special Exhibtions of Works by Emil Carlsen,: Corcoran Gallery of Art, Washington, D.C., 1923. (46) Carlsen, “On Still-Life Painting,” p. 7. (47) Emil Carlsen to Claude Buck, Jan. 16, 1927: In this letter Carlsen also writes, “…so many painters stop when difficulties begin. Technically, a canvas should, in my brief, be carried as far as an artist’s abilities will let him…[a] great many of the so called modern men consider intention everything. I differ with them—the greatest idea is always spoiled if careless in drawing, color, or finish.” Archives of American Art, reel 2982. (48) Carlsen, “On Still-Life Painting,” p. 8. 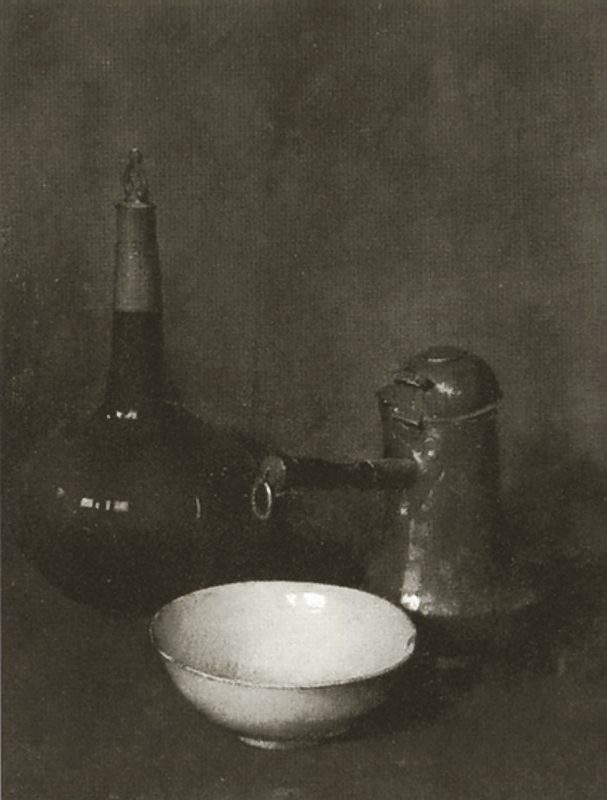 (50) Arthur Edwin Bye, Pots and Pans—or Studies in Still-Life Painting, Princeton, 1921, pp. 214-15. (52) Letter from Dines Carlsen to Helen E. Keep, June 16, 1947, Archives of American Art, reel D8. (53) Carlsen’s large painting after Titian’s Bacchus and Ariadne in the National Gallery London, appeared on the market in 1990 (Paris auction by M. Yves de Cagny, Drouot Richelieu, Salle 9, June 25, 1990, No. 36). The date and circumstances under which the painting was produced are unknown, but its existence suggests a rather extended and otherwise unrecorded sojourn in London. (54) Carlsen to former student Claude Buck, Feb. 14, 1931. Archive of American Art, reel 2982. (55) Elizabeth Luther Cary, op. cit., p. 11. (56) Emil Carlsen, “On Tempera,” Palette and Bench, 1, 10 (July 1909), p. 225. In a letter to Claude Buck, Feb. 3, 1930, Carlsen states: “…I nevertheless enclose the very best formula for canvas preparation. It is the oldest and best Italian method and absolutely permanent and sound. When you use it exactly as per formula it is absorbent, when too little zinc white it may crack—but it is well worth taking pains…It holds the color splendidly, and if you have a great deal of drawing to be done on your picture, you can lay it in in tempera or water color. If you can not get the caseine and a high grade of zinc in Chicago, kindly send me word, and I will send you a box full.” Archives of American Art, reel 2983. 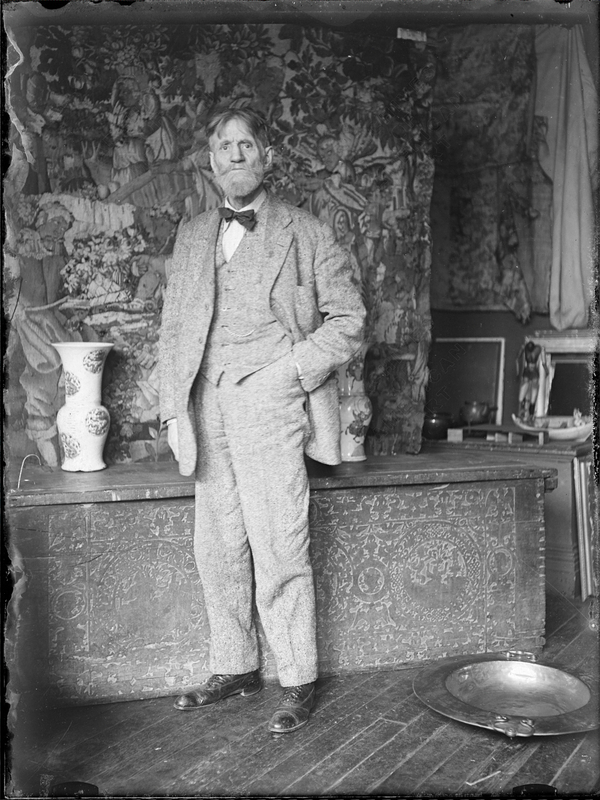 (58) Duncan Phillips, “Emil Carlsen,” International Studio, 61 (June 1917), p. cx. (59) New York Herald, Apr. 10, 1904, Sect. 3, p. 10. (60) “Talk of the Studios,” New York Times, Dec. 3, 1905, p. 8. (61) See, New York Sun, Apr. 3, 1909, p. 6; Independent, Apr. 29, 1909. (62) See, New York Herald, Apr. 5, 1909, p. 9; also Mar. 30, 1909, p. 9; New York Times, Apr. 11, 1909, Sec. II, p. 2; New York Post, Mar. 30, 1909, p. 7. (63) See, New York Herald, Mar. 3, 1910, p. 13; New York Post, Mar. 5, 1910, p. 7; New York Sun, Mar. 13, 1910, sec. II, p. 4; International Studio, 40 (Apr. 1910), p. li. (64) See, Buffalo Evening News, Mar. 18, 1910; Mar. 19, 1910; also, Art News, 9 (Apr. 15, 1911), p. 3. (65) See, New York Post, Apr. 16, 1910, p. 7. The exhibition was held between Apr. 18-30, 1910. (67) Carlsen to Macbeth, postcard from Norway postmarked July 7, 1912 furnishes a London address, and letter from Vejle(?) Denmark, Nov. 7, 1912 states, “It has been a very bad and rainy year, but I have some work, some canvases good.” Archives of American Art, reel NMC5. In 1911 Carlsen was also reported to be planning a summer trip to Denmark: “Ben Foster and Emil Carlsen are enjoying the beauties fo Falls Village, but the latter will spend a part of the summer in his native Denmark.” American Art News, 9 (June 17, 1911), p. 3. (69) The Academy correspondence which records his involvement there begins with a letter of June 10, 1912 from the Academy to Carlsen. (70) Carlsen to John Frederick Lewis, Academy President, Mar. 28, 1914: “I thank you very much for your appreciative and charming letter. I had thought to stop teaching after this year especially as my health has not been good this winter but I will be very glad to talk the matter over with you before the season is over.” Archives of the Pennsylvania Academy of the Fine Arts. A similar account is given in letters to Acdemy Secretary, John Andrew Myers of Jan. 8, 1917, “…Unfortunately, I have no new canvases, as I have not been able to work very much on account of ill health”, and Feb. 28, 1917, “I am extremely sorry that I shall not be able to give any talks on art this year at the Academy schools. My health is poor, and any exersion [sic] tires me too much. I have had to curtail my work—so I have to deny myself the pleasure of visiting you.” Archives of the Pennsylvania Academy of the Fine Arts. Seperately, Carlsen wrote the Macbeth Gallery on Aug. 20, 1915 “I have not done very much work this year—only taken care of my health, but will be at it again in earnest now.” Archives of American Art, reel NMC31. (72) Carlsen in a telegram of June 25, 1917 to John Andrew Myers states, “Shall be glad to give a few talks next winter as I am in better health.” Archives of the Pennsylvania Academy of the Fine Arts. (73) Carlsen to Macbeth, July 20, 1917. Archives of American Art, reel NMC31. (74) Paintings by Emil Carlsen, N.A. and Dines Carlsen, A.N.A., Feb. 5-18, 1929, The Macbeth Gallery, New York. (75) See, New York Herald, Dec. 28, 1919, Sec. II-1, p. 7; also New York World, Dec. 26, 1919, p. 4; New York Tribune, Dec. 21, 1919; Sun, Dec. 22, 1919, Evening Post, Dec. 13, 1919; Philadelphia Record, Dec. 28, 1919; Brooklyn Daily Eagle, Dec. 7, 1919; American, Dec. 14, 1919. 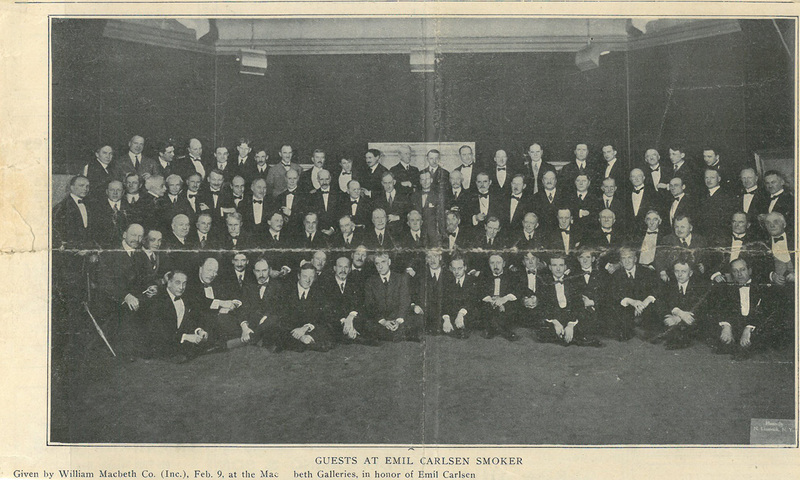 (76) To mark the opening of this exhibition on February 8, Macbeth held a festive “Smoker” in Carlsen’s honor. See American Art News, 19 (February 12, 1921), p. 1, 7; World, Feb. 13, 1923; Brooklyn Daily Eagle, Feb. 13, 1921; New York Times, Feb. 20, 1921; New York Tribune, Feb. 15, 1921. (77) Art News, 21 (March 10, 1923), p. 2; New York Times Mar. 11, 1923, sec. VIII, p. 11; New York Tribune, Mar. 11, 1923; Christian Science Monitor, Mar. 14, 1923; New York Evening Post, Mar. 17, 1923. (78) New York Herald, Mar. 11, 1923. (79) Special Exhibition of Paintings by Emil Carlsen, Apr. 3-29, 1923, The Corcoran Gallery of Art, Washington D.C.
(80) Information provided by Mr. Joseph Fudali, a longtime friend and associate of Dines Carlsen. Of several auctions of Chase’s property, the sale in question was most likely that of 1912 (Valuable Paintings and Watercolors Forming the Private Collection of William Merritt Chase, N.A., American Art Association, New York, March 7-8, 1912). (82) New York Tribune, Feb. 15, 1921. (83) Duncan Phillips, A Collection in the Making, New York and Washington, DC, 1926, p. 42. (84) August Bontoux, to Claude Buck, Jan. 15, 1927 (see n. 8). (85) An example of his attitude was shown in regard to his Picture from Thibet, as he wrote to Macbeth on Oct. 27, 1922, “So far as the Tibethean [sic] canvas is concerned at present I shall keep it. I hold it in a high price, as you knowm and am not a bit anxious to sell it, even at that price. It is a picture of a certain kind of finish I shall never attempt again.” Archives of American Art, reel NMC31. (86) Carlsen to Macbeth, Sept. 3, 1926. Archives of American Art, reel NMC31. (87) August Bontoux, to Claude Buck, Jan. 15, 1927 (see n. 8). (88) New York Times, Dec. 28, 1919, Part VIII, p. 6. (89) Carlsen to Claude Buck, Mar. 25, 1928, Archive of American Art, reel 2982. (91) Art Digest, May 1, 1935, p. 15; New York Times, Apr. 28, 1935, sect. X, p. 7; Art News, May 4, 1935, p. 11; New York Sun, Apr. 24, 1935; New York World Telegram, Apr. 25, 1935; Brooklyn Daily Eagle, May 5, 1935; New York Tribune, Apr. 28, 1935. (92) New York Times, Apr. 26, 1935, art-books sec., p. 17. (93) New York World Telegram, Apr. 25, 1935. (94) Carlsen to Claude Buck, Mar. 25, 1928. Archive of American Art, reel 2982. 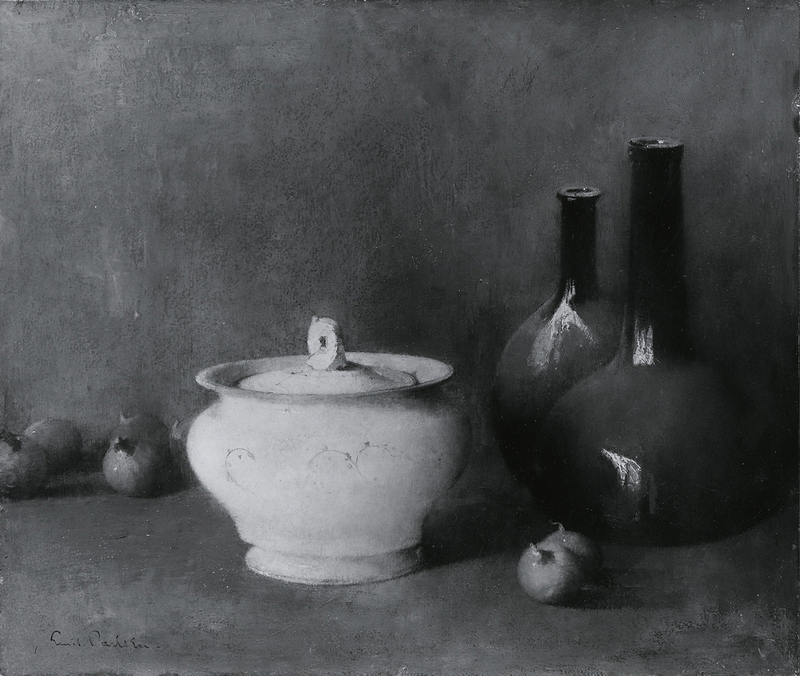 Emil Carlsen : Ming vases [and ginger jar], 1931. Emil Carlsen : Still life with ceramic vase, ca.1923. 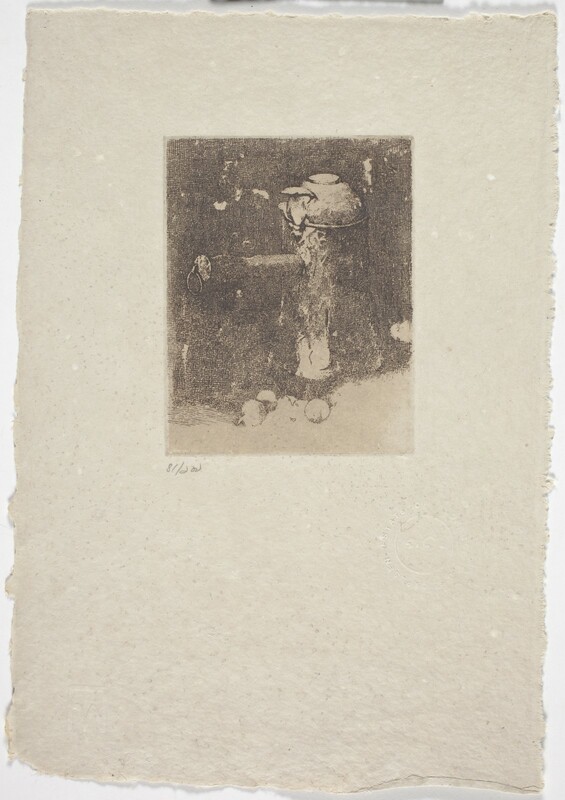 Emil Carlsen : The picture from Thibet [sic], ca.1920. 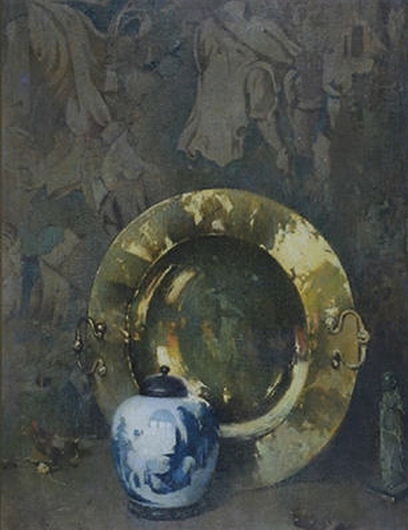 Emil Carlsen : Roman bowl, ca.1920. Emil Carlsen : Peonies, 1919. Emil Carlsen : Still life—the fan, 1918. Emil Carlsen : The golden background, ca.1916. Emil Carlsen : The mandarin’s necklace, 1915. Emil Carlsen : The fan, ca.1915. Emil Carlsen : Violets, ca.1897. Emil Carlsen : Still life with chrysanthemums, 1896. Emil Carlsen : China and cherries, ca.1893. Emil Carlsen : Still life of chrysanthemums in a canton vase, 1893. Emil Carlsen : Red jug and chicken, 1893. 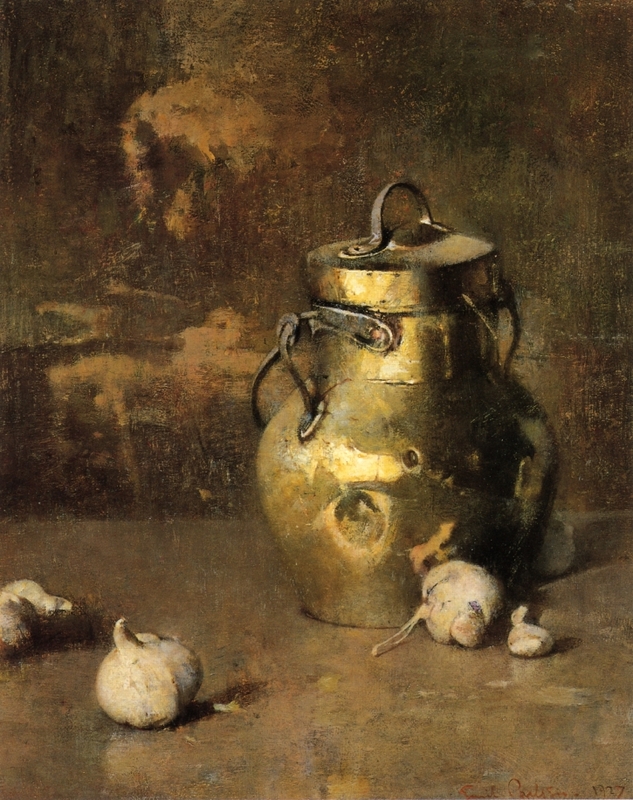 Emil Carlsen : Still life [with chicken], 1892. Emil Carlsen : Still life [with fish and pot], 1891. Emil Carlsen : Flowers [in copper urn], ca.1885.